Amos (Wes Chatham) and Alex (Cas Anvar) having some Real Talk. io9: I can pretty much guess why The Expanse doesn’t have a Comic-Con presence this year, aside from being one of the shows included on the Amazon Prime panel. 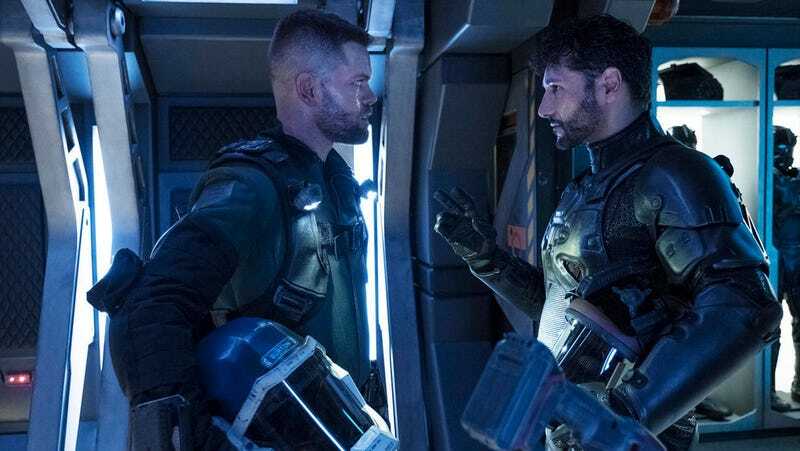 io9: Were you surprised when Syfy said it wasn’t planning to renew The Expanse for a fourth season? And to be completely fair, I think Syfy was, too. This was not a creative thing. I think they were incredibly proud of the show, but the business structure of the deal—the fact that they didn’t own it, the fact that they’re on basic cable, that they have to support it with ad-based revenue. That’s a whole other thing, and I think a lot of economic factors came into play. But at the end of the day, we got canceled. Anna (Elizabeth Mitchell), making the face I made when I learned The Expanse was cancelled. io9: What did you think of the fan response to the news? io9: How much time actually passed between being canceled on Syfy and Amazon picking the show up? Naomi (Dominique Tipper) and Camina (Cara Gee), takin’ care of Belter business. io9: Where are you at with season four? Shankar: We’re writing and developing it. We jumped in pretty quickly after we got the pickup news, and amazingly, we ended up getting probably about 90 percent of our crew back in Toronto, which is fantastic. They were all holding out hope that it was going to happen—I mean, bless their hearts, everybody, that’s how much they wanted to be back on it. So yeah, we just jumped in. We’ve only been writing for about four or five weeks, but we’ve laid out the season, we’ve pitched it to Amazon at this point. It’s already been really, really fun and I’m really excited about it. Bobbie (Frankie Adams) charts a course into the unknown at the end of season three. Holden (Steven Strait), Alex, and Naomi on the Rocinante. io9: The authors are obviously involved in the writing process, but do they also advise on the other aspects of The Expanse production? Previously deceased character Miller (Thomas Jane) returned in season three, sort of. io9: Is it harder to keep the show feeling real now that the characters are exploring alien worlds? io9: What’s been your favorite moment of the show so far? Shankar: I’m personally very fond of the whole Maneo slingshotter thing in season three. It’s one of my favorite things that I may have ever put onscreen in my career. It’s such a great prologue on the page, and when I read that I was like, “Okay, we gotta do this right.” And having that be the bridge between the end of the previous book and the beginning of the next one at that point in the season, it’s a pretty awesome moment.